What is the Maker's Guild? origami, polymer clay, wood carving, spinning yarn, sewing, stitching, embroidery, anything. We are also open to those who just want to hang out and chat with us about our projects. Yes. In fact we strongly encourage you to, though it's not required. You don't have to post pictures if you can't or don't wish to do so. Be supportive of each other's endeavors. Figured maybe posting here would inspire me to actually get working on my projects. I've tried out most forms of crafting and used to be really into sculpting (I made polymer clay dragons) and sewing. I haven't sculpted in a while, but I can help answer any questions. I've been sewing since I was maybe 10 or 11. My mom was amazing at sewing (and pretty much any craft she tried) and she's done her best to direct me through some projects (she has no use of her arms). My recent sewing projects have been curtains and valances and a dress that I have no idea if I'll ever finish. It's the first time I've used a pattern in a long time and first time without help. In the past I've enjoyed sewing stuffed animals. I've slowly been working on making my own patterns for various ones, but I've been a bit stuck on poses, what kind of animals to do, and the basics of making the shapes right. I've also recently been learning to make braided rugs. My mom made a lot of them and has been talking me through it. Luckily, she has a whole stash of wool for me to use and all the equipment. I have her notes too if anyone was interested in those. So far I've only gotten to the braiding part and not putting it together. And I've been thinking about learning to knit again. I've never gotten further than just knitting square pieces. I don't think I've ever even been taught how to finish them. So if anyone has any good resources that would be awesome! I want to be able to knit my mom some nice wool socks. It's so expensive to buy hand knitted ones. And I bet she'd love ones made by her daughter even more. Hi ocean! I've never tried polymer clay or sculpting really, I did try some needle felting 3d animals once and quickly realized I have no skill with it. Several of my great aunts and my grandmother were skilled at sewing but I've never quite picked it up. I'd like to though, maybe in a year or two. Rug braiding sounds cool, I'd love to see how you do that. Knitting! I taught myself from Youtube videos and a couple books, but mostly the videos because I have an easy time learning visually from video. There's a website called Ravelry that's huge with lots of forums including many for beginning knitters. And they have patterns available, both free and paid. So many patterns. I knit socks with magic loop from the toe up and usually use a pattern called Fish Lips Kiss heel for the heels. A plain sock can be pretty simple in construction because most of it is just knit stitches in the round. If you want, I can hunt up some of the videos I watched to help you. My thing is mostly handspinning and knitting, with some crochet. My most recent handspun yarn is this one. I used dyed Gotland locks that I flicked open and then spun from the fold to get a soft, drapey 2-ply yarn. I love long wools, they have such pretty luster if you spin them right. Here's an in progress pic that shows a little of everything. Unflicked locks to the left, flicked and ready to spin on the right. At the top is a bobbin with a spun single. Oh, and I'll put this here as bait for Enchanteddil. Heya! I'll come back later this weekend with some examples, but I knit, crochet, hand sew/embroider (usually with beads), and play with clay and wire. 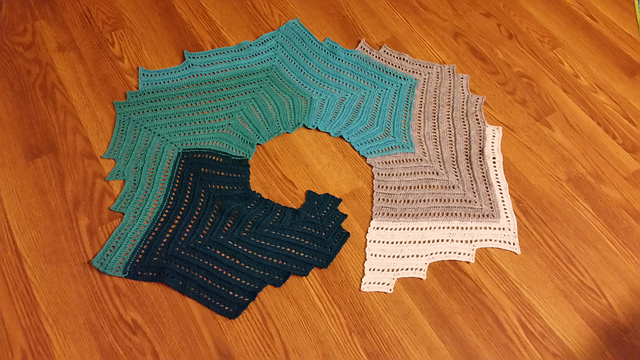 That's actually in reverse order for how long I've been involved with each one--I think I've been knitting for less than a year. I see my bait worked. I'll try and get that scarf out and take some better pictures over the weekend. Hi Wolfsister! I look forward to seeing you share your projects with us. Looking forward to see what you guys post (knitting/crocheting related). Will be some great inspiration for my mom. I... make decorative butterflies out of different materials. Tulle, wire, glitter, beads, feathers and foam - stuff like that. Do these count as crafy-things for your lovely guild? Never really got to show them around. 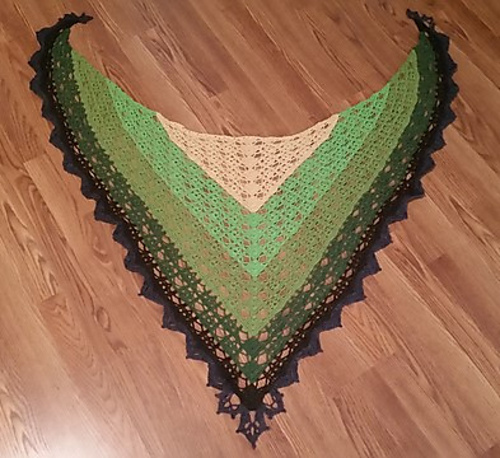 I crochet some, but I never get my tension right, so I tend to not go by a pattern. I have some decorations I crocheted in my profile. Right now, I'm working on a circle sweater for my granddaughter who turns 2 today. If I ever finish it (I've ripped it out and restarted twice already lol), I'm going to make myself a new scarf. I'm actually a lot further on the scarf, just don't have a more recent picture. ShaiNeko wrote: I see my bait worked. I'll try and get that scarf out and take some better pictures over the weekend. 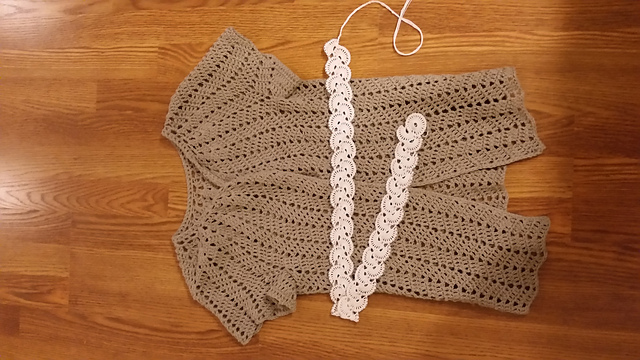 Real wrote: Looking forward to see what you guys post (knitting/crocheting related). Will be some great inspiration for my mom.